The many who came to Washington as Smoots protégés and studied at GW Law include luminaries like David M. Kennedy, BL 35, BA 37, Hon. 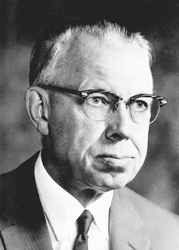 DL 65, chairman of the board and CEO of Continental Illinois Bank and secretary of the treasury under President Richard M. Nixon; Ernest L. Wilkinson, JD 26, who served as president of Brigham Young University from 1951 to 1971, spearheading its growth into the largest religious university in the United States, and George W. Romney, JD 30, governor of Michigan from 1963 to 1969, chairman of American Motors Corp. from 1954 to 1962, and secretary of the Department of Housing and Urban Development from 1969 until 1973. If you wanted to go East from Utah to study law, The George Washington University was the place to go, says James A. Holtkamp, JD 75. As the group grew in number, they organized, forming The Utah Legal Club at GW in 1921 with more than 30 members, led by president Vernon Romney, JD 22. The group thrived, holding monthly meetings on campus and stimulating the formation of several other state legal clubs, according to a 1922 issue of GWs student newspaper, The Hatchet. The club remained active through the 1960s. Many alumni who returned to Utah to practice became ardent supporters of GW Law and of the rich experience of living and studying in the nations capital. 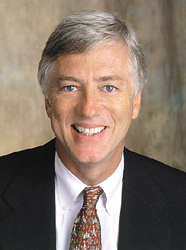 The tradition begun by Smoot has contributed substantially to both the development of the legal community in Utah and to GWs growth as an internationally regarded law school. The legacy continues. This May, Brennan Moss, grandson of distinguished GW Law alumnus Frank E. Moss, JD 37, U.S. senator from Utah from 1959 to 1977, will graduate from the Law School, joining hundreds of Utahns who preceded him across the commencement stage. On the pages that follow, we share stories from a few of them. Left to right: Frank E. Moss, JD 37, U.S. 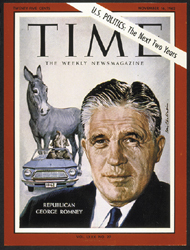 Senator from Utah from 1959 to 1977; Michigan governor from 1963 to 1969, George W. Romney, JD 30, on the November 16, 1962 cover of TIME magazine; Ernest L. Wilkinson, JD 26, who served as president of Brigham Young University from 1951 to 1971; and David M. Kennedy, BL 35, BA 37, Hon. DL 65, Treasury secretary under President Nixon. 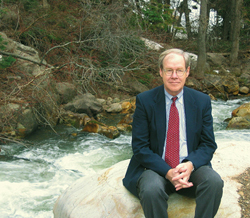 Environmental lawyer James A. Holtkamp, JD 75, says that once he decided that he wanted to go to law school, there was little doubt in his mind which school he would choose. A partner at the Salt Lake City office of Holland & Hart, Holtkamp specializes in environmental law, with an emphasis on climate change and sustainable development. He has actively represented industry and government clients in various environmental, natural resources, and project development issues throughout the western United States. Holtkamp also has worked as an adjunct law professor since 1979, first at Brigham Young University and now at the University of Utah. GW Law is truly a family affair for Thomas A. Quinn, JD 63, and Mary Anne Q. Wood, JD 76. Their grandfather, Carlous Badger, they believe, was the first of Smoots protégés to attend the Law School while serving as the senators secretary on Capitol Hill in 1907 and 1908. He took great pride in the fact that he had the chance to go to law school at GW, says Quinn of his grandfather. The brother and sister each decided for their own unique reasons to follow in his footsteps. Quinn practiced law for more than two decades in Washington, Los Angeles, and Salt Lake City before founding Far West Capital Inc. in 1983. He serves as vice president and general counsel of the company, which has developed and oversees the operation of four geothermal power plants and nine limited service hotels. Earlier in her career, Wood served for two decades as a law professor at Brigham Young University, publishing numerous books and articles, including the first casebook in the field of employment law. An active community member, she served for 12 years on the Utah Supreme Court Advisory Committee on Civil Procedure and is currently a member of the board of directors of Beneficial Life Insurance Co.
As the eyes of the world collectively focused on Utah for the 2002 Winter Olympic Games in Salt Lake City, Francis H. Suitter, JD 67, was much more than just a local face in the crowd. The founder and president of Suitter Axland in Salt Lake City served two terms as a member of the Utah Sports Authority, charged with locating sites for, constructing, and maintaining athletic facilities for the 2002 Games. Long before he stepped onto the world Olympic stage, Suitter was a very visible presence in community, state, and national affairs in his native Utah. He chaired the Utah State Republican Party during the 1996 presidential election and currently serves as the Utah State Finance Chairman for Bush-Cheney 04. Utah Gov. Michael Leavitt appointed him chairman of the Judicial Nominating Commission of the Third Judicial District Court, as well as co-chairman of the No! Coalition, formed to stop the storage of high-level nuclear waste in Utah. After earning his juris doctor degree with honors from GW Law, Suitter returned to Utah and associated with a Salt Lake City firm before founding Suitter Axland in 1975. He serves as president and managing director of the 20-attorney firm, where he specializes in government, corporate, business, and banking law. If youve ever driven through Utah, chances are good that you filled up your tank or bought a snack at a Maverik Store. 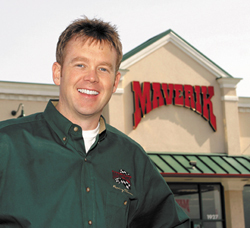 The largest independent marketer of gasoline and convenience products in the Intermountain West, Maverik operates 170 convenience stores in seven western states. Brad Call, JD 93, serves as general counsel and vice president of the family-owned and operated company, founded in 1928 by his grandfather, Reuel T. Call. Calls dream was quickly realized, when, as a law student, he landed an internship as a lobbyist at the Fluor Corp., the largest engineering and construction company in the world, which turned into a full-time job. I worked in the companys Washington office for four years and, after graduation, spent some time in their Irvine, Calif., corporate legal office, he says. The great tradition begun by Reed Smoot continues to link prominent Utahns across the generations. One current luminary is Salt Lake City Mayor Ross C. Rocky Anderson, JD 78, who was recently re-elected to a second four-year term (see article on Anderson in the April 2002 issue of GW Law School magazine). A longtime civil litigation attorney in Salt Lake City, Anderson skillfully steered the city through the 2002 Winter Olympics and is now focusing his attention on urban revitalization, fighting suburban sprawl, and reforming drug policies. Other well-known Utah alumni include Howard L. Edwards, JD 59, who served in lead positions at Atlantic Richfield Co. for nearly three decades; Tom Welch, JD 72, president of the Salt Lake City Bid Committee for the Olympic Winter Games, and numerous judges and politicians. Many distinguished GW Law alumni from Utah have sadly passed on, but their great accomplishments continue to shine brightly. One example is George W. Romney, JD 30, whose illustrious career included serving three terms as governor of Michigan in the 1960s and as secretary of the Department of Housing and Urban Development. As chairman of American Motors Corp. from 1954 to 1962, Romney played a key role in bringing the compact economy car to the U.S. public. His son Mitt Romney is the current governor of Massachusetts. Another prominent alumnus was U.S. Sen. Frank E. Moss, JD 37. 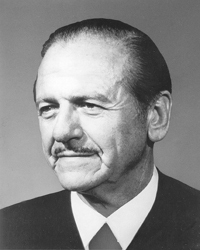 During his 18 years of service in the U.S. Senate (1959-1976), Moss gained national attention for his work on environmental, consumer, and health care issues. 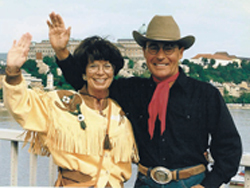 A member of the Interior committee for many years, he was a powerful figure in the areas of water reclamation, energy use and conservation, and national parks, working to secure additional national parks for Utah. Moss also initiated important investigations into the care of the elderly in nursing homes, and into Medicare-Medicaid fraud. He was perhaps most famous for sponsoring a measure banning cigarette advertising on radio and television and requiring improved labeling on cigarette packages about the health hazards of smoking. Utah-born David M. Kennedy, MA 35, LLD 37, Hon. DL 65, enjoyed a stellar career, serving as secretary of the Treasury under President M. Richard Nixon and chairman of the board and CEO of Continental Illinois Bank. Kennedy served on numerous advisory panels under both Democratic and Republican administrations and was a long-time member of the staff of the board of governors of the Federal Reserve System. Two prominent brothers included among this prestigious group were Brigham Young University President Ernest L. Wilkinson, JD 26, and Glen A. Wilkinson, JD 38, a prominent Washington law practitioner who chaired GWs board of trustees. 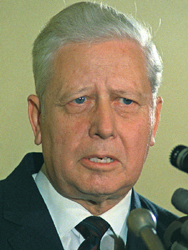 Ernest Wilkinson, who graduated at the head of his GW Law class, headed Brigham Young for two decades (1951-1971), spearheading its growth into the largest religious university in the United States. Earlier in his career, he founded his own law firm in Washington, which gained fame for its work representing the Ute Indians. The list goes on and on, very much like the special relationship between GW Law and the people of Utah.